Hello all! It's time to document the final element of my British Outfit; the trousers. I sourced my wool from Middle Campscott Farm in Devon for £30.50 per metre. The natural colour of the wool is a pale cream and I knew immediately that I would have to dye it, partially for aesthetic reasons and partially because cream trousers are practically an open invitation for stains. I looked at lots of different options for dyeing my wool, including onion skins, oak galls, leaf printing and woad. The red onion skins gave a lovely rust colour when I tested them but that was to a ratio of 8 onions per 10cm square of fabric. However, I was not up for the peeling, or eating of that many onions. Oak galls would have given me the dark black colour that I was after, but by the time I was hunting for them they had just gone out of season and the only supplier I found sourced them from Germany. Leaf printing did not work very well, perhaps due to the texture of the wool, the leaves used or my inexperience. Woad would have given me a lovely blue but would have cost me £40 for the shade of blue that I wanted for 2m of wool and involved chemicals that I did not want to use. This left me with one option: weld. I had first counted weld out of the equation as it is primarily a yellow dye, however theoretically I could use iron to make it more of a khaki green colour. I bought 500g of it from woad-inc to match my 500g of fabric and got going! Before I did anything with the weld I had to make my own iron water as I hadn't found any iron oxide that was produced in the UK. This meant that I had to make my own. Later on I discovered that you can buy some from The Outside Dyer on Etsy. I popped down to the scenic department at uni and procured some rusty nails which I stuck in water for a week or two until the water was a gold-y brown colour. 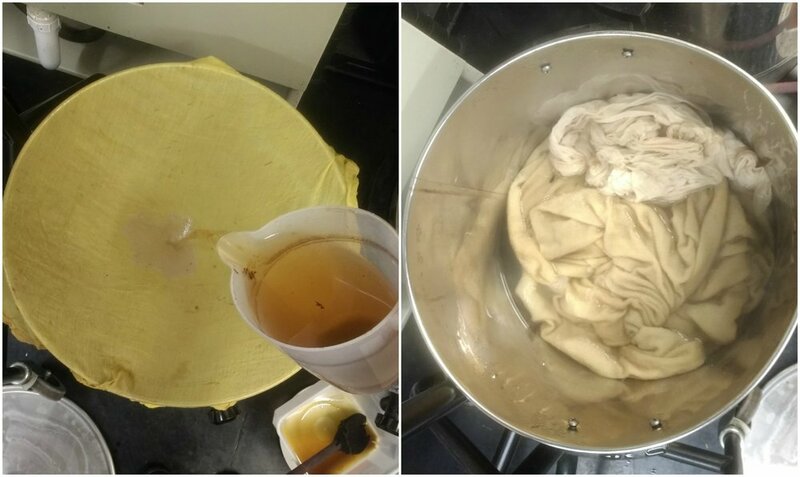 I added the fabric to a pot of water, strained in the iron water and simmered for 10 minutes. Next time I'd add the iron water before the fabric because I felt that the iron concentrated on certain parts of the fabric so the dye was not as even as it could have been. I had silk fabric in there with the wool as that was going to be the lining for my trousers which I wanted to be the same colour. Next it was time to start the weld dyeing process. First the woad was bundled into muslin and placed into boiling water to simmer for 1 hour and left overnight. You can see the colour difference of the water in the pictures below. In the morning I removed my bundle and replaced it with the fabric to be dyed. This was then simmered for 1 hour. Then I rinsed all of the excess dye out of the fabric and hung it to dry. I ended up putting the wool on the spin cycle in the washing machine because otherwise it would quite frankly have been a slip hazard with all of the dripping that was going on. I was really quite pleasantly surprised with the experiment, considering I had done no trial run I was really pleased with the colour achieved. Next up, the making of the trousers!